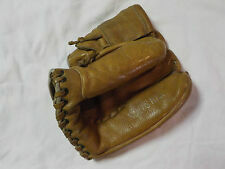 Vintage JOE DIMAGGIO Type BASEBALL GLOVE 114S by Buffalo Leather Sporting Goods Mfg. Marked: Genuine Cowhide Oil Treated - Professional - Hand Formed Pocket. Split finger style. Original 1940s-1950s era. Fair to Good condition, some wear / age / stains. A couple of small spots of paint or ink- one on thumb, one on basket. Mark of some sort near model number. Leather is still rather soft and puffy. It definitely needs some proper care and attention after all these years. The inside lining appears nice & soft & feels really good when worn. Nice button and patch. Classic! SHIPPING BASED ON LOCATION. Please pay immediately after purchase. Be sure to check our other items! This one of a kind look will make an impression among your antique baseball collection ! Just ask ! And We can customize too ! Model GJ99 -11". for RH thrower. Rawlings Baseball Glove. MICKEY MANTLE. NEW York Yankees. Complete w/deep well pocket,hinged pad. Good pre-used Condition. 'The Finest in the Field'. Excellent Condition. Fully Conditioned and ready to use. All NEW Lace ! ALL SILVER INTACT. GLOVE SEEMS UNUSED . Roger Maris Spalding 1960’s Vintage Baseball Glove NY Yankees Exactly as pictured From a recent estate sale Shipped with USPS Priority Mail. Larry Yogi Berra. Signature Model. Good condition. See photos for content & surface condition. Catfish Hunter baseball gloves. Lot of 2 gloves. One Mizuno and one Wilson. 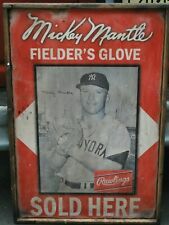 New Listing1960's Mickey Mantle Baseball Glove, Excellent Condition! 1960's Mickey Mantle Baseball Glove. 1950's Whitey Ford Model Baseball Glove, Excellent Condition! 1950's Whitey Ford Model Baseball Glove. Glove is for Right Handed Thrower. Made in USA. Good Condition. This glove has NEW lace install in all locations of the glove. I have a Rawlings MM3 Mickey Mantle baseball glove USA made ! This glove is for the LEFT HANDED thrower as the glove fits on the RIGHT hand ! I measured the glove to be 11.5 inches but it feels a little bigger ! The glove is in Phenominal condition ! The glove is very clean ! No writing anywhere ! No cracking ! No splits , rips or tears anywhere ! The lacing that connects the tops of the finger tips does show its age ! It is in tact and original ! The piping and logos are excellent ! Leather Piping ! The lettering is very good ! The glove is very comfortable to the hand and fingers ! Fits my adult size hand comfortably ! Broken in very nicely ! It's just a very nice glove in really nice condition ! Shipping will be priority by the USPS ! Gerald Francis "Jerry" Coleman was a Major League Baseball second baseman for the New York Yankees and manager of the San Diego Padres for one year. Lower Palm is marked "J.C. Higgins, 28" , 1615. Glove is in very good condition. Slight tear on wrist guard. Limited edition mitt - I believe this was a give-a-way promotion. a baseball glove for a little one or addition to your collection. (Rawlings MM5 Micky Mantle baseball Glove. Glove is in Near mint - Mint condition. This glove has not be used. It is the nicest Mantle glove I have had in the last 30 years. 2) There is slight wear on the "R" & "L" threads on the Rawlings label. Made in USA. Right Hand Throw. Nice old mitt. Ready to use or for your collection. Leather is in excellent condition as are strings. There is also a glove oil/condition stain inside the mitt. Commonly seen on a previous used glove. I have taken many pictures indoors and outdoors, with many angles of glove. It has normal wear from previous use, age & storage including spotting, wear, age wear, age spotting, loose laces ties and/or missing laces at the top of the glove, etc. (Sold As Is). SOLD AS IS. Leather is flexible and in good condition. (maybe a youth size glove?. but not sure). It fits on the left hand, and features Dual Hinge webbing, Grip Tight pocket, and Snap Action. It just needs a little cleaning and oiling, and does show minor wear. 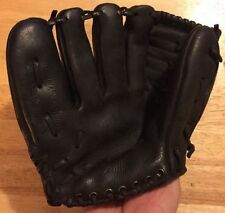 Rawlings Baseball Glove LHT PL90MB Players Series All Leather 9" Excellent !!!! 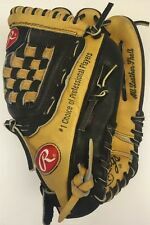 Rawlings Baseball Glove LHT PL900MB Players Series All Leather 9" Excellent !!!! 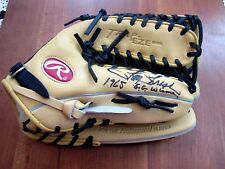 This is a Vintage Spalding 42-3362 endorsed by Bobby Murcer professional Yankees Baseball Glove RHT Glove. When I open the glove to check the markings it brought tears to my eyes . The glove is worn . It has been cleaned . There are no tears or holes . Some light marks from I am sure a woman defilement history of baseball games. Shipped with USPS Priority Mail. 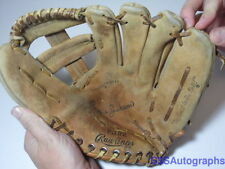 Vintage 1953 WILSON Billy Martin Baseball Glove. Professional Model. Made In USA. Condition is Used. Shipped with USPS Priority Mail Medium Flat Rate Box. RARE LEFT HAND THROWER YANKEE CLIPPER GLOVE BY HOLLANDER. JOE DIMAGGIO SIGNATURE MODEL WITH JOLTIN JOE IN THE PALM OF THE GLOVE. JOE DIMAGGIO MODEL SIGNATURE ON THE LEFT SIDE. YANKEE CLIPPER LINE NOTED AS WELL. This glove does show heavy wear. -Fair condition. Needs new lacing. 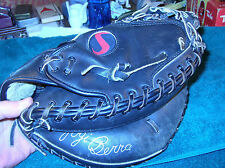 This glove is a Right Hand Throw Model and features a Deep Well and an L Heel. The leather on this glove has been kept conditioned and is nice and buttery but the fingers do need to be re-laced. It would be nice to see this glove brought back to life and would not take much to make this a useable piece again. But look at the pictures closely to gather your own opinion! New ListingVintage 1958 New York Yankees Team Signed Souvenir Baseball, Mantle, Berra Nice! 27 stamped signatures including Mickey Mantle, Casey Stengel, Whitey Ford, Yogi Berra, Elston Howard, Bobby Richardson, Don Larsen, Gil McDougald, Moose Skowron, Tony Kubek, Ralph Houk, Enos Slaughter, Hank Bauer, Virgil Trucks, Norm Siebern, Bob Turley, Johnny Kucks, Art Ditmar, Andy Carey, Tom Sturdivant, Darrell Johnson, Murry Dickson, Duke Maas, Ryne Duren, Bobby Shantz, Frank Crosetti and Jim Turner. 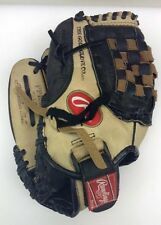 Used catcher's mitt, as pictured with general wear from active use. The fabric lacing is intact and appears original. Silver embossed lettering is intact and readable, including Dickey's fascimile signature. Subject : Joe DiMaggio. The glove is sold "as-is" as we cannot render an opinion on the signatures. buy it now?. (B) Raw - but authenticity uncertain (AS IS - SALE FINAL). We are NOT card graders, and we do not send any consigned cards in for grading. 1954 Bowman 1 Phil Rizutto + Reach "Scooter" Rizzuto Baseball Mitt - 50's youth? That being said, let's begin with the card. Now about the mitt. On the plus side, no writing as kids so often do, was on the mitt, yay! If you look at pic #4 & 6, you'll see how it started and how it ended after conditioning a couple of hours later. Good item for a Yogi or collector. This is likely from the late 1950's to early 1960's. Check photo for condition.